Thanks to a seemingly endless stream of rainy days followed by the incessant rains of Hurricane Florence, Wilmington, North Carolina saw a record-setting amount of rainfall in 2018. Heavy downpours, raging winds, and high humidity can wreak havoc on outdoor window treatments. So, what are the best window covering solutions for this climate? The key is a combination of weather-proof features: humidity-resistance, light and heat-filtering, and all-around durability. Here, your best options for our sunny, hot, humid and storm-prone climate. For a beach house with crisp white features and modern luxury, you can’t go wrong with Hunter Douglas Palm Beach shutters. These durable poly satin shutters are heat and humidity-resistant and won’t chip, warp, or fade over time. We love their classic look. And, their UV-resistance is ideal for giving you a break from the hot summer sun. With the beauty of the southeastern North Carolina coast comes strong winds, abrasion from sand, and constant humidity — all of which can quickly ruin traditional wooden plantation shutters. But if you adore the southern charm of these classic window coverings, don’t give up on them just yet. Faux-wood plantation shutters provide your home traditional southern beauty without the warping, swelling, or peeling that comes with real wood shutters. They’re a great choice for your Kure Beach getaway, cottage on Bald Head Island, or whichever coast you call home. Even better? They’re easy to clean, eco-friendly, and more affordable than wood shutters. Like faux-wood plantation shutters, faux-wood Bahama shutters are a stylish choice for beautiful outdoor window treatments, without the price tag or shortened lifespan of real-wood shutters. With Bahama shutters, you can give your home a burst of color and incomparable privacy – ideal for the side of your home facing the sun (or the neighbors). Louvered shutters tilt upward to let fresh air in without heavy sunlight. 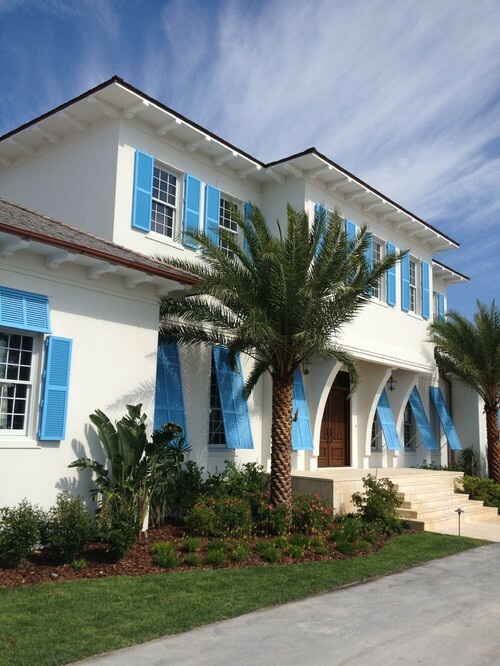 Beyond this, Bahama shutters can also protect your home from flying glass and debris come hurricane season. If you want lots of light, though, you may want to consider a different shutter; Bahama shutters do not open entirely. While other outdoor window treatments can be constructed to be storm-proof, hurricane shutters remain your best bet when Florence’s friends come to town. If you’re a long-term coastal North Carolinian who prizes preparation and safety, consider adding hurricane shutters to your home. They’re available in multiple colors and finishes, as well as fixed, hinged, multi-fold, and sliding panel styles. As it turns out, you can have the best of both worlds: gorgeous coastal weather and the outdoor window treatments to match. Ready to discover yours? Give us a call at Strickland’s Blinds, Shades & Shutters or swing by our showroom. Your window treatments project is just one free on-site consultation away.